On Saturday we discovered good things come to those who wait as we harvested over 50 lbs of potatoes from the DIRT GROUP gardens! We purposely left a few rows to attempt to harvest now, in time for the harvest celebration banquet and we succeeded! 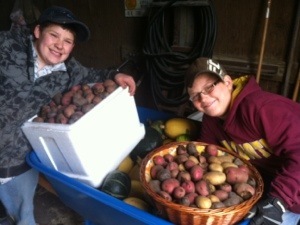 We retrieved purple, red, and gold potatoes for our banquet! Check out how pleased these young men appear with the day’s harvest. This entry was posted in education, mental health, social work. Bookmark the permalink.